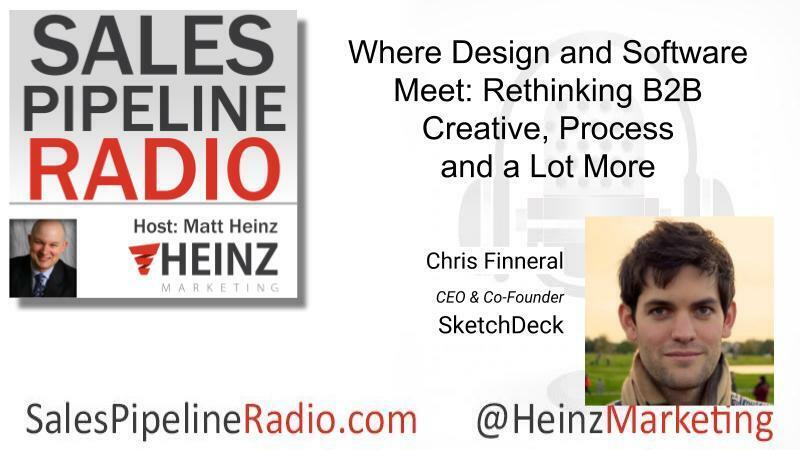 We were happy this last time to have Chris Finneral,CEO & Co-Founder at SketchDeck on in an episode called, Where Design and Software Meet: Rethinking B2B Creative, Process and a Lot More. We talk about (among other things) this idea that the sales pipeline just appears over the horizon. I ask Chris, in his experience as a serial entrepreneur, is sales pipeline development that easy? "It's prospecting, generating leads is always something which requires work. Even if you have something that's awesome that everyone wants, you need to really educate your market, educate the leads, and put a lot of work into that. I actually was reading a quote recently that was saying especially for startups, people always overestimate how hard it is to build the product and underestimate actually how much effort it is to acquire customers. I think that's very true. It takes a lot of work to get your pipeline and get lots of customers for your product." Listen in below and/or read the full transcript on the Heinz Marketing blog starting Mon. 4/15 at 6am PDT. Sales Pipeline Radio is sponsored and produced by Heinz Marketing on the Funnel Radio Channel. I interview the best and brightest minds in sales and Marketing. If you would like to be a guest on Sales Pipeline Radio send an email to: [email protected].